Understanding stock market terminology is an essential step to becoming a profitable investor. In fact, not knowing these terms could end up costing you money down the road. With all of the stock market lingo out there, it’s not uncommon for an investor to think a term means one thing, when it actually means something else. 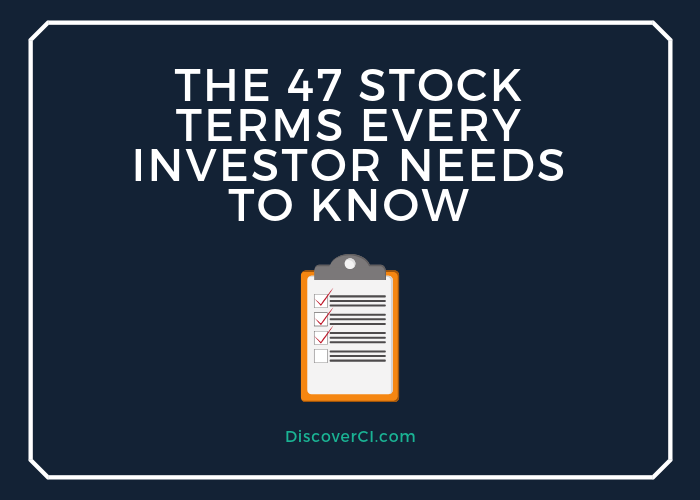 In this post we’ll cover 47 key stock market terms every trader needs to know in order to become an expert investor. A stock exchange is a market that is a established to buy and sell stocks. Two of the main stock exchanges in the United States are the New York Stock Exchange (NYSE) and NASDAQ. A stock market index is used to measure a section of the stock market. It is computed from the prices of the selected stocks within the index (typically a weighted average). Indexes are often used as a measure of the overall direction of the stock market. A few of the major stock indices are the S&P 500, the Dow Jones Industrial Average, the Russell 1000, and the NYSE Composite. When the stock market is in a period of prolonged increasing stock prices, it is said to be a bull market. Individual stocks can be bullish or bearish too, as can certain groups of stocks, like a stock sector. When the stock market is in a period of prolonged decreasing stock prices. This is the opposite of a bull market and can also apply to an individual stock or group of stocks. A stock quote is the current price of one share of a company’s outstanding stock. A stock quote usually provides additional information, such as the bid price, ask price, last traded price, and current volume. The open price is the price at which a stock first trades at the start of a trading day. The closing price is the price at the end of the day when the stock market closes. The bid price is the price a buyer is prepared to pay for one share of a company’s stock. Ask price is the lowest price a person selling a stock is willing to accept for a share of that stock. Volume is the number of shares traded during a period of time. A stocks daily volume shows how many times it was traded that day. Stock volatility is a statistical measurement of a company’s change in stock price. It is measured by the standard deviation or variance between returns from the stock. Beta measures the volatility of a company’s stock compared to the overall market. By definition the market beta is 1.0. A stock’s price swings more than the market over time if it has a beta greater than 1.0. Companies with a high beta generally are higher risk, because their stock price experiences larger and more frequent pricing swings. Investors often use the term “shares” interchangeably with stock. The stock of a company is all of the shares that are divided between the different owners. A company’s share price (or, stock price) represents the cost to purchase a single share of company. Fundamental analysis attempts to identify which stocks have a market price below their intrinsic value, and thus, provide a high value investment. Investors using fundamental analysis believe that market prices do not accurately reflect all available information on a company. This can result in discrepancies between market pricing and the actual fair value of a stock, which can be used to a traders advantage. Financial analysis relates to analyzing a company’s income statement, balance sheet, and cash flow statement. This is often done by calculating financial ratios, which are then compared to market and industry competitors. An investment strategy is a set of guidelines or rules used by an investor to select stocks for investment. There are lots of different investment strategies. Value investing, growth investing, and investing based on technical analysis are a few common investment strategies. Value investing is an investment strategy where stocks are selected that trade for less than their intrinsic values. Value investors look for undervalued stocks, and generally hold these stocks for longer periods of time. Technical analysis is often considered the opposite of fundamental analysis. This strategy uses charts and market trends to identify patterns in a company’s stock price. Technical traders use these patterns and trends to attempt to predict future movements in a Company’s stock price. A growth investing strategy attempts to identify stocks that will experience rapid future growth. This strategy typically performs best in a period of strong overall market performance. Blue chip stocks are popular stocks to buy for dividends. These stocks usually pay higher dividends, because they are often times more mature companies with lower future growth potential. They are usually some of the larger stocks within each individual industry. Dividends are cash payments to stockholders out of a company’s current earnings. Dividends are a way of attracting investors to buy a company’s stock. Not all companies pay dividends. Dividend yield measures how much dividends a company pays to investors each year relative to its share price. Dividend yield is calculated by dividing the dollar value of dividends paid during the year per share of stock, by the dollar value of one share of stock. Investors use different stock valuation methods to calculate the theoretical value of a company's stock. This can be compared to a company’s current value to determine if a stock is over or undervalued. A valuation ratio that compares a company’s stock price to its earnings. The formula to calculate a stock’s price to earnings ratio is: Close Price / ( Net Income / Weighted Average Shares Outstanding). Marketcap refers to the total market value of a company based on its stock price and total shares outstanding. Investors frequently use marketcap to measure the size of a company, which can be helpful when comparing two companies. When a company sells its shares to the public, it authorizes a certain amount of its stock that is available for sale. A company’s shares outstanding represents the number of stock units currently owned by investors. Another valuation ratio, which compares a company’s stock price to its revenue. The formula to calculate a stock’s price to revenue ratio is: Close Price / ( Total Revenue / Weighted Average Shares Outstanding). Enterprise Value measures a company’s total value. The formula to calculate enterprise value is: Marketcap + Net Debt + Total Preferred Equity + Noncontrolling Interests + Redeemable Controlling Interest. EBITDA is a common metric used by investors to evaluate a company’s earning potential by adding back significant non-cash expenses to net income. EV to EBITDA is a popular valuation tool, which compares the value of a company, debt included, to the company’s cash earnings less noncash expenses. EV to EBITDA is especially helpful for comparing companies within the same industry. To calculate EV to EBITDA, divide a company’s enterprise value, by its EBITDA. Intrinsic value is the value of a company determined through fundamental analysis, which is in contrast to valuing a stock based on market value. There are number of methods used by value investors to determine a company’s intrinsic value. Three methods frequently used are: (1) Discounted Cash Flow Analysis, (2) Analysis based on a Financial Metric (such as Price to Earnings), and (3) Asset Based Valuation. A person (or website) who buys and sells a stock on your behalf for a fee. A limit order is an order to buy or sell stock at a specific price or higher. A buy limit order would only be executed at the limit price or lower, and a sell limit order would only be executed at the limit price or higher. Fill or kill (FOK) is when an investor submits an order to buy or sell a stock that is executed either immediately and completely, or not at all. The order is either filled within a couple of seconds, or is cancelled. No partial completion of the order is allowed. Buy or sell is a measuring tool that investors use to determine whether to buy or sell a stock based on its current price. Whether a stock receives a buy or sell rating depends on the investment strategy used to analyze the stock. A market sector refers to a specific group of stocks. The group is determined by the markets in which they compete. Sectors are often determined by the type of product a company sells to customers. Examples would be the technology sector, or healthcare sector. Industry and sector are often used interchangeably, but there is slight difference. A sector generally refers to a larger segment of the economy, while an industry describes a more specific group of companies. The trading day refers to the hours in which a stock exchange is open for trading. For example the New York Stock Exchange is open from 9:30 AM Eastern Time to 4:00 PM Eastern Time. Trading days are usually Monday through Friday, but stock exchanges typically close on holidays as well. A margin account is set up by an investor with their broker. A broker will then lend the investor cash to purchase shares of stock. The loan is collateralized by the stocks purchased and cash within the account. The investor is then charged an interest rate on the amount of cash received from the broker. A margin account is risky, because it allows a trader to invest more money in a stock than what they currently have in cash. Day trading refers to buying and selling stock on the same day, which is usually done online. The goal of day trading is to profit on small, short-term fluctuations in a company’s stock. Day trading is generally higher risk than long-term investing. Shorting a stock, or short selling, involves selling a stock that an investor doesn’t own. The investor completes the sale by borrowing the stock from a third-party. The investor then pays back the third-party at a later date based on the then current value of the stock. Investors use this strategy when they believe a stock's price will decrease. A tool used by investors to search for stocks that meet a specific criteria. Stock screeners are useful to find stocks in a particular industry, or stocks that meet an investors investment strategy. Averaging down is a reference to the common stock investing mentality of buying low and selling high. Investors average down by accumulating shares over a longer period of time (rather than buying all shares at the same time). This helps investors avoid buying shares at a company’s peak. When a company first offers to sell its shares to public buyers. This happens when a company decides to trade its stock on a stock exchange, rather than remain owned by only private and inside investors. A company’s annual report, or Form 10-K, is a required document that a public company must file with the SEC once every year. This report is used by investors to evaluate a company’s annual financial performance. Backtesting is used by investors to test a potential trading strategy against historical results. A strategy is tested against historical results to measure how well it would have predicted a stock’s performance. With repetition and experience, stock market terminology will be part of your daily vocabulary in no time. Did we miss any stock terms that you’d like to see on this list? Let us know and we’ll get them added!